This umbrella base is the bee’s knees! Beautifully designed in Art Deco styling, this 50 pound Umbrella Base by Treasure Garden will add a nice arty touch of “roaring 20’s” glamour to your outdoor space and will be the perfect complement to your patio furniture! 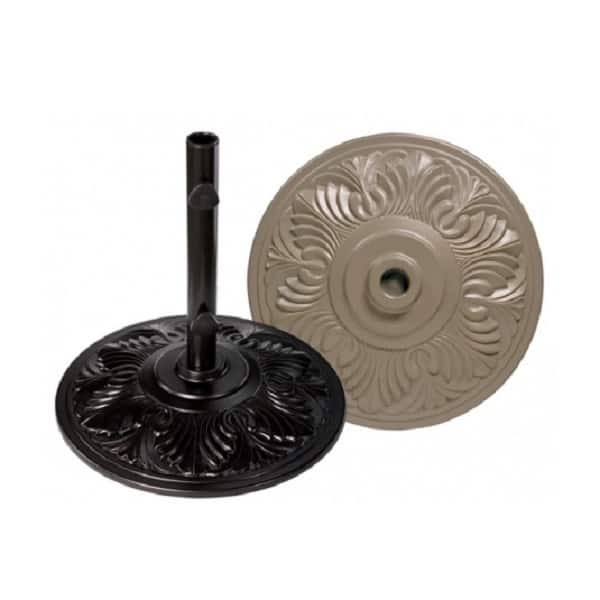 A hefty 50 pounds, the Art Deco umbrella base features a cast aluminum shell with a cast iron core. This beauty will not budge on a windy day! The Art Deco Umbrella Base by Treasure Garden comes standard with a dual-purpose stem. It also has an optional extra 30 pound weight you can add as well as an optional 2” stem, so it can be used for larger and free-standing umbrella applications. The Art Deco Umbrella Base is available in five fabulous finishes.